A mileage calculator & road map. Homepage. 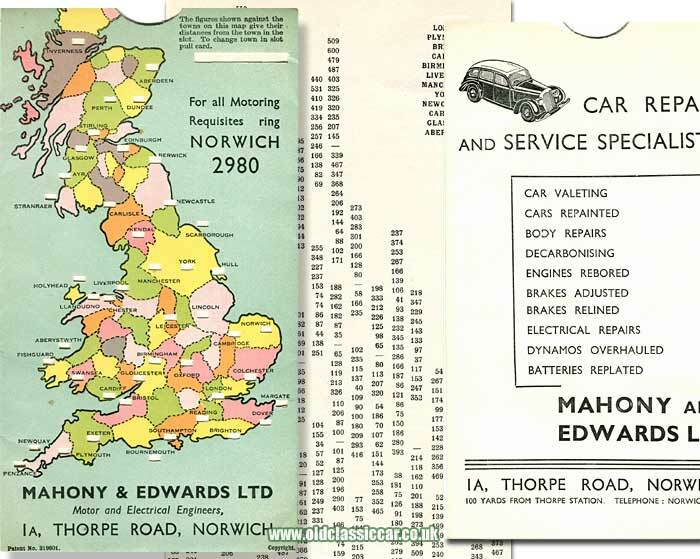 This page: A handy route calculator given out by a garage in Norwich in the 1950s. Various free items were given out by garages and other motoring organisations in the 1950s - including maps, coasters, desk blotters and pens, examples of which can also be found in the collectables category of the site. This though, a simple mileage calculator, I've not seen an example of before. It was given away by a garage named Mahony & Edwards Ltd, of 1A, Thorpe Road, in Norwich (100 yards away from Thorpe Station). A first glance it looks like a simple map of Britain. Let into it though are slots, placed close to each city or town name. A card of mileages and town names slips into this slim wallet, the mileage numbers appearing in the town/city windows, and the town names themselves in a separate viewing window at the top right of the calculator. The slide-in mileage sheet is double-sided, each with twelve destinations on it, and associated mileages. To establish the distance between two locations, slide in the mileage sheet until one of the towns or cities appears in the top right window. Now, glance at the other location that forms the journey. The distance between the two places is presented in the small window, in miles naturally. As an example, to establish the distance between say Manchester and Aberdeen, the former city is displayed to the top right, and the mileages associated with it and the destinations included on the map are given. In the pre-motorway days, before online route planners, satellite navigation and mobile phone apps came along, cheap and cheerful paper-based planners such as this would be very useful to have in the car, in addition to the usual road maps. In the 1920s, Geographia Ltd came up with their own route planning publication which gave both mileages between two points, and also an indication of the direction you'd need to head in - more information on this can be found here. Judging by the illustration of a car (with a very Rover-like grille to it) on the reverse of the planner, this must date to the 1950s.